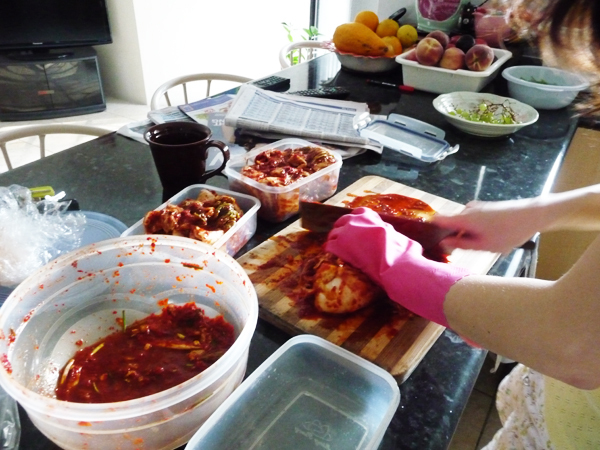 My sister and I made Kimchi a few days ago but I was too lazy to blog. Actually, I took really bad pics because I was doing half the process so I only took pics of the start and end. Haha! So we only made one cabbage first just in case it turned out to be an absolute disaster. I’m making pasta for dinner tomorrow! Maybe I’ll take pictures. My tragus piercing has been feeling irritated after I went to a BBQ on Monday. Maybe all the BBQ smoke and mojo affected it? T-T Please get better, Mr. Tragus. I also started watching Secret Garden! I heard mixed reviews about this one. People said it was either really good or just really boring? But I really like it! :o I don’t think I had much expectation from it…before I watched it, it was more like “Ah Hyunbin…we meet again”. I forgot how good he was! Anyway, I’m going to prance around and hope that my tragus’ mood will improve.